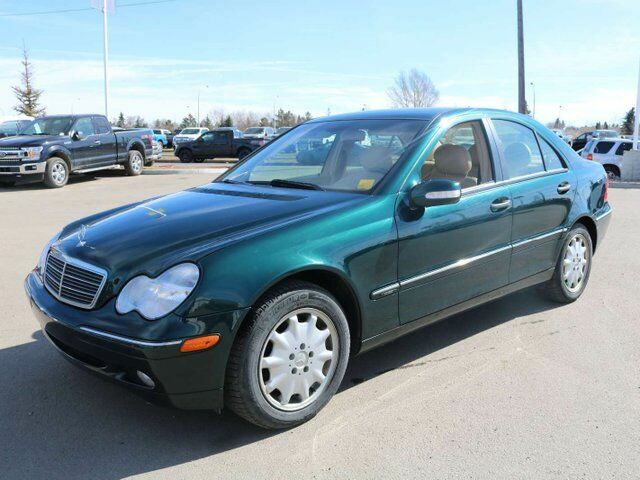 Hitting the sweet spot between capability and comfort, our 2004 Mercedes-Benz C240 is presented here in Green! Powered by a stout 2.6 Litre V6 offering 168hp while connected to a 5 Speed Automatic transmission. This combination produces near 9.4L/100km on the open road. Our C240 is ideal for the daily commuter, or someone wanting to hit the town with class and status. Our C240 amenities include a premium sound system with CD, leather seats, automatic rain-sensing windshield wipers, automatically dimming mirrors both inside and out, an emergency communication system, and so much more. Take a look at the features and pictures, or better yet, come see in person, you will not regret it! Safety is emboldened into every Mercedes-Benz, and the C240 is no different. ABS, 4-Wheel Disc Brakes, Frontal Driver and Passenger Airbags, and Daytime Running Lights just to name a few of the safety features. Consumer reviews show most are quite happy! Print this page and call us Now... We Know You Will Enjoy Your Test Drive Towards Ownership! Vehicle has a $7,224.80 carproof claim. Previously registered in British Columbia. AMVIC Licensed Dealer.